One question asked members of these 25 countries whether or not they believed their countries were generally liked or disliked. Results show that well over half of the population of the South Caucasus countries believed that their respective countries are generally liked: 76% of Armenians, 68% of Georgians and 52% of Azerbaijan agreed with the statement. Many of the Western European countries on the list are either hubs of tourism or have a history of international interaction (e.g., history of colonial, economic or political prominence). 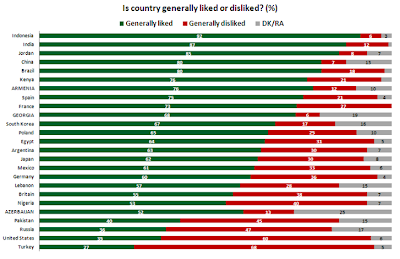 These countries have lower percentages of DK/RA responses. Politically-contentious states such as Russia and China are either overshadowed by regional conflict such as in the case of Lebanon in the Middle East, South Korea which is often related to issues involving North Korea, or China, Russia and Pakistan. The South Caucasus region could also fall into the politically contentious category and they are relatively isolated from the international arena. In this way, citizens who said that they didn't know or refused to answer have also provided interesting information just as those who said that they perceived their country to be generally liked or disliked. Please visit CRRC’s webpage for the 2010 CRRC Caucasus Barometer and the webpage for the Pew Global Attitudes Project to get more information about the surveys, or to access the original questionnaires and datasets. We would love to hear your thoughts on this theme as well!